I've been using Natio for years and years. They're a wonderful Australian company that's completely underrated. They're a plant based beauty range that offer skincare, cosmetics and bodycare. Natio don't test on animals and a lot of the range is vegan friendly. You can find out what products aren't suitable for vegans here. Over the years I've used a lot of their products and today I'm writing about my favourites from the line. This was released many many years ago and I LOVED it. It was actually the very first illuminator that I fell in love with. Sadly they discontinued it and I ended up buying 3 of them so I wouldn't be without. In 2013 they brought them back. There are 2 shades available. Warm Day is my favourite as it has a pink based illuminator, while "Sunshine" has a golden illuminator. These retail for $17.95 and last ages. If there's only one Natio product you buy, make it this! I've previously reviewed this and you can see swatches here. This was in their "Sheer Delights" collection a while ago and it was love at first use. It has 5 colours in it, that you can either use together or by itself. 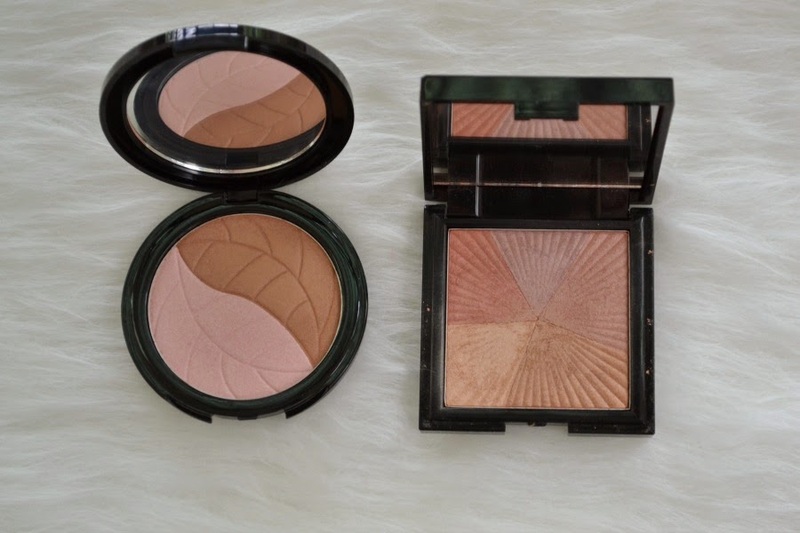 It gives you a gorgeous glow on the cheeks as well as being a beautiful eyeshadow. This was so successful that they released another colour called "Rosey Glow," which is a more pink based palette and is more suited to my pale, cool toned skin. These lip liners are a long lasting formula that's waterproof and smudgeproof. It has a built in sharpener, so it's great for travelling or in your make up bag for touch ups. It has a gorgeous lightweight feel that goes on easily. 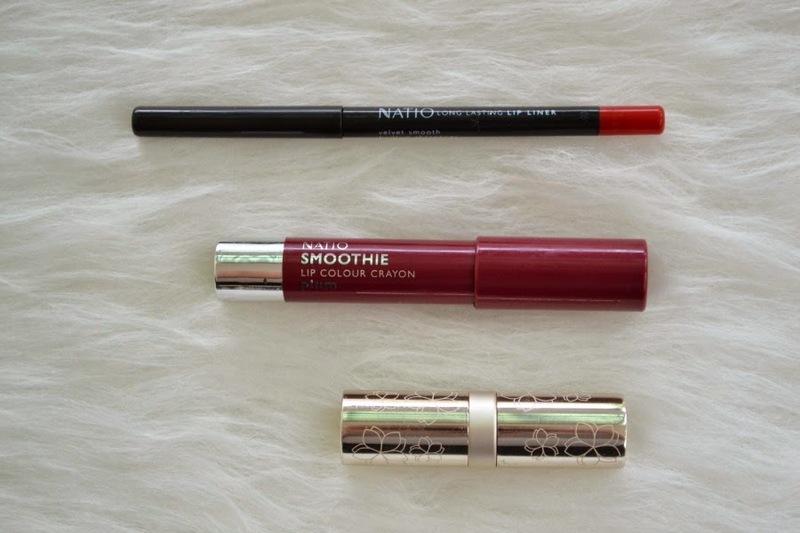 These are beautiful lip crayons. They feel really soft on your lips and they can give you a soft wash of colour or a brighter, more intense colour too. They contain jojoba seed oil and shea butter to moisturise your lips. I like to have this in my handbag as they're easy to use on the go. They're only $12.95, so they're so affordable. This was a lipstick that was released in their "Bloom & Glow" collection. The packaging is different from their staple range (which is plain black) and I love how luxe it looks. The lipstick is amazing!!! It feels so incredibly hydrating and goes on easily. I hope that they reformulate their original lipsticks to this formula!! This is the 3rd or 4th tube of this that I've bought. I use it either as a moisturiser or as a non silicone primer. It helps to reduce redness and helps brighten the skin. It feels lightweight and sinks into the skin easily and quickly. I adore facial oils and this version is great. It's lightweight and sinks into the skin easily. I prefer to use this on my face and neck. It's $19.95 for 15mls, so I find that it's not wise to use it as a body oil (instead I use the Trilogy RHO as it's cheaper to buy a large bottle). I sometimes put a drop or two in with my day moisturiser or otherwise I like to use the RHO as a serum. These are from a limited edition range, but they're amazing!! As someone who can never finish a nail polish, these mini sizes are wonderful. They have a 3 free formula and had a great mix of brights and pastels. Hopefully they come out with more in the future. They retailed for $5.95 for 9ml. 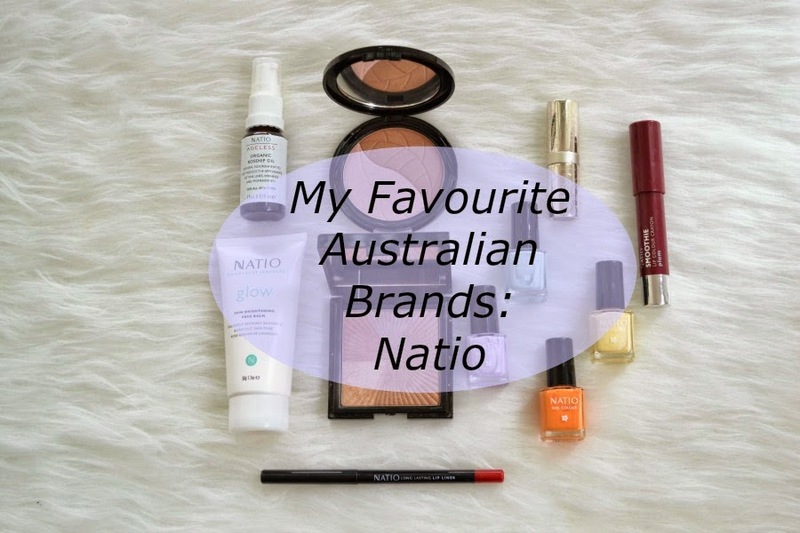 And those are my favourite Natio products. 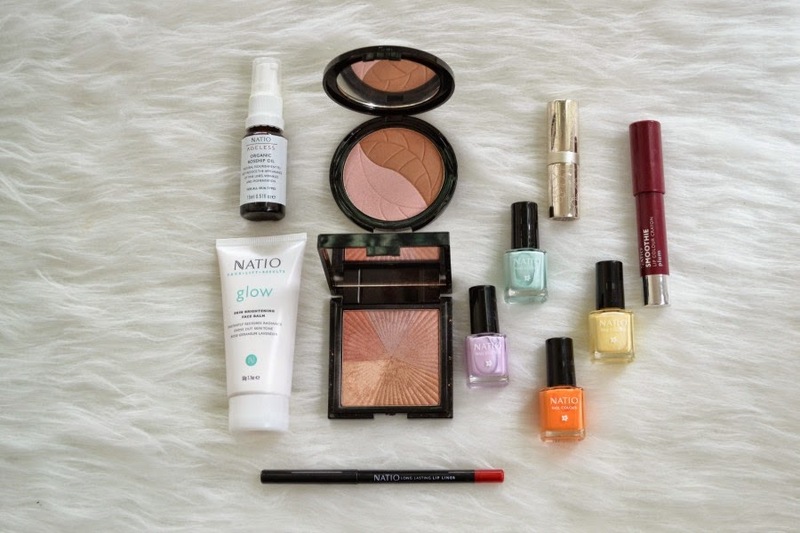 Another thing that I love about Natio is their GWP deals. They often have affordable and wonderful packs every 2-3 months, so you can always stock up and get to try out new products too! 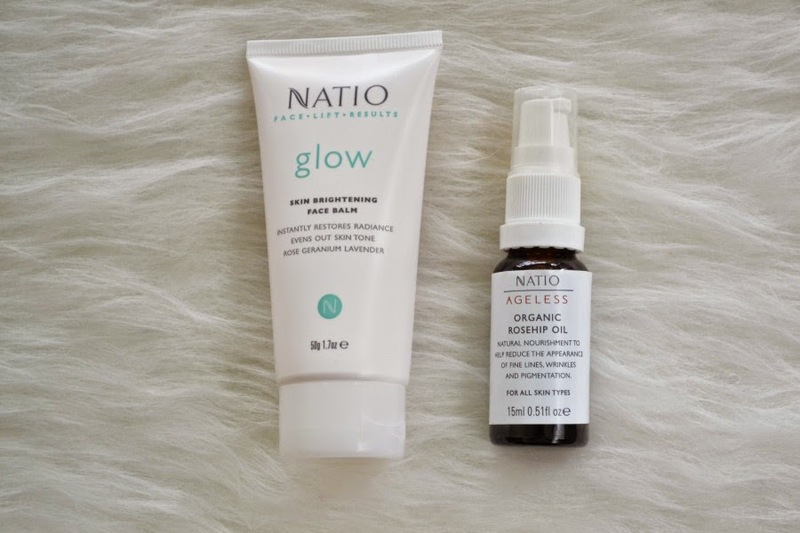 Have you tried Natio before? What's your favourite product? PS Keep an eye out as they're releasing a new collection at the end of March and it looks soooo beautiful!! I have heard of this brand and many have said that its a great product to try out. And they seem to prove it right. I am eyeing to try those lip products.